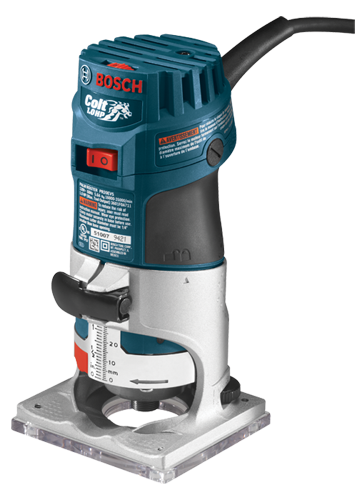 The Bosch PR20EVS Colt electronic variable-speed palm router combines power, precision and versatility in a small-sized tool. It has a 1.0 HP, 5.6 Amp motor that spins at a variable speed of 16,000 to 35,000 RPM. The variable speed dial is conveniently mounted on top of the tool body. The router features Constant Response circuitry, which maintains a consistent speed by detecting heavy loads and increasing power to maintain the selected RPM. It features soft-start circuitry, which reduces startup torque. Additionally, depth adjustment is simple; just align and lower the motor and then lock the router in position with the clamping level. Micro-fine adjustments are equally effortless, thanks to the wheel on the back of the router's base. It accepts standard 1/4 In. bits for flexibility, with an impressive max cutter diameter of 1-5/16 In. The motor housing has a palm-shaped, rubber over-molded grip that allows for comfortable operation. And the included rugged aluminum fixed base is durable, solid and precise.